The heat between these two is generated by instinctive tension. Mars in Aries will feel too pushy for Moon in Cancer, but she’ll push back with a self-protective swipe. 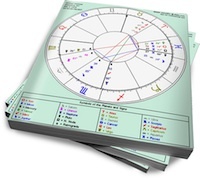 A volatile interplay of passionate jousting will be set up, because each partner is strong in the sign they rule (Mars rules Aries and the Moon rules Cancer). Mars in Aries is the warrior, driven by the desire to win. Making the first move, beating the competition and breaking new ground are expressions of his will. His actions are who he is; he gets restless (and can feel as if his life force is draining away) if he’s bored or restricted. Mars in Aries is a passionate partner who does best with a lover who allows him room to move forward, but who also challenges him. If she can provide him with a series of small battles (that he eventually wins, but not too easily) she’ll maintain his heat and interest. Moon in Cancer is the warrior, driven by the need to protect her space. This (initially) cautious Moon is not typically viewed as a warrior, but her Cardinal impulses and need to nurture home and family make her the original Mama Bear if she feels her den is threatened. Moon in Cancer’s lover will reap the benefits of her nurturing, but will discover her volatile side if he doesn’t respect her boundaries (or if someone threatens him). Mars in Aries will put the moves on Cancer, and she’ll retreat into her shell. If he persists, she’ll jab at him with a warning to back off, which will only encourage him. They’ll do this little dance for awhile, until (or if) Moon in Cancer decides that’s it’s safe to let him in. There’s no fear of things becoming stagnant, because Aries will always be challenged by Cancer’s unpredictable moods, triggered because he’ll make her feel on edge with his dislike of domestic coziness. This union can work, as long as Aries respects Cancer’s need for safety, and Cancer respects Aries’ need for freedom. If they have a common domestic goal, they can band together and create a formidable, protective army of two.